One of the longest arguments in horror fiction and filmmaking is over a very simple question: to show, or not to show? The novelist and director Clive Barker one said of monster movies: "I hate that school of filmmaking where for the first hour you see a foot, for the second hour you see a hand, and then you finally see the monster for five seconds before it gets blown up by an atom bomb." For those too squeamish to throw in their lot with Barker, or his partners-in-slime David Cronenberg and John Carpenter, The Haunting is Exhibit One in the case of withholding the monster to produce terror. Along with close counterpart The Innocents, it has become the Bible of the modern cinematic ghost story, whose influence can be seen in everything from Alien to The Others. Though not a masterpiece by any standards, it remains essential viewing for any horror fan. In both its story and its production, The Haunting comes from very deep-rooted stock. The haunted house movie had been around in some form for over 40 years, and in the 1940s the genre produced such classics as The Uninvited and The Canterville Ghost, one of the big influences on Tim Burton's Beetlejuice. 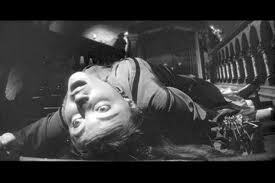 Robert Wise, the film's director, came from a background in low-budget horror, having helmed such titles as The Body-Snatcher and The Curse of the Cat-People. But the first success of The Haunting is its departure from both the increasingly comedic tone of the haunted house movie and the ultra-low budget look pioneered by Wise's benefactor Val Lewton. 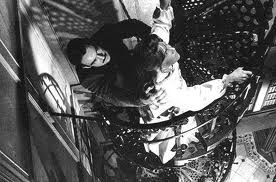 Whereas the spooks in The Canterville Ghost were included primarily for comedy, the ghostly forces present in The Haunting are inherently malevolent towards the inhabitants of Hill House. The impressive exterior shots (of Ettington Hall in Stratford-upon-Avon) situate the story in the serious end of gothic fiction, being reminiscent of the wide shots in Alfred Hitchcock's Rebecca. The visuals of The Haunting are very restrained, and are well-complimented by the score by classical composer Humphrey Searle. Wise shot the exterior scenes of Hill House on infra-red film to create a grainy, amorphous look for the stones and give the impression of an ancient monster lurking within. His composition is very good, choosing his angles and edits very carefully to wring the most tension you could out of a door slamming or heavy footsteps on a wooden landing. Like most great ghost stories, the central dilemma of The Haunting surrounds whether what we are seeing is reality or a particular kind of insanity: in other words, are there ghosts, or is it all in the mind of Nell? The lengthy voiceover in the early section of the film makes the character naturally unsettling, not simply because she is sensitive but because the tone of our thoughts gives the impression of her being at least partially mentally unhinged. Though it seems obvious to point out, The Haunting was a huge influence on The Shining. But beyond Stanley Kubrick's general intention to put his own stamp on the classic ghost story, there are whole scenes in The Shining which either pastiche The Haunting or lift directly from it. Compare the sequence of Jack Nicholson driving his family to the Overlook Hotel with Nell's long drive to Hill House. Both Nell and Jack Torrance have a frenzied quality behind the wheel, as if both know that they are leading themselves, their loved ones and the audience to certain doom - and though Torrance shows it more, both are somehow excited by it. On a thematic level, The Haunting is about humans' attempts to rationalise the supernatural - to paraphrase Dr. Markway, to give a name to what we don't understand, even if the name is meaningless. The desire to prove the existence of the supernatural through science is found throughout mediaeval and early modern philosophy, with thinkers as varied as Thomas Aquinas and Rene Descartes believing that the scientific method could reveal the essence or nature of God. The Haunting is the latest chapter in this long line of inquiry, and as with Aquinas and Descartes, its findings are decidedly ambiguous and inconclusive. 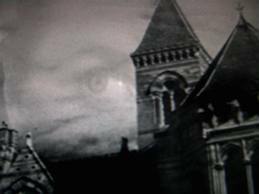 Subsequent ghost stories like The Orphanage have explored the link between science and the supernatural from a technical point of view - for instance, by showing the movements of a medium on infra-red cameras. But despite the scientific intentions of Dr. Markway, there is precious little cold science in The Haunting. Markway enters the house with purely rational intentions, seeking to objectively study, record and observe rather than pass judgement or live in fear. But as the nights wear on, the house rebels against his attempts to impose order, until he concludes that the only sensible thing to do is to burn Hill House to the ground. Much of the success of The Haunting lies in its ability to make us see things which aren't necessarily there. There is a comparison with Repulsion in the way that the architecture of Hill House seems to embody some sinister force, ever-present and ever-threatening. Wise is no Roman Polanski, but he does manage a couple of good tricks, making us see faces in the wallpaper, eyes in the window of the tower, and something deeply sinister in the blank expression of the marble statues. As with The Shining, the terror of The Haunting comes from the fact that so little is explained. There's nothing on the level of the man in the bear suit or Jack Torrance's appearance in the photograph, but we are still left with uncertainty as to whether or not Hill House was haunted, or whether we have just spent two hours in the midst of a deranged mind. 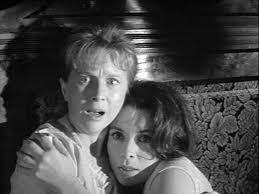 Julie Harris gives a really great performance which is convincing and engaging even in the moments where she is bouncing off the walls. The flaws with The Haunting lie in aspects of it which are too close to the riper end of studio horror. In the midst of several really good scares, there are numerous shots of characters running into mirrors or being scared by their reflections, things which feel silly or cheesy within the context of the story. Some of the special effects are creaky even for the day; we can see the wires pulling down the mirror on the mantelpiece, and when one character falls down the stairs in the prologue, it looks stunted and over-choreographed. Elsewhere the film resorts in certain small ways to cliché, deriving a couple of jumps or scared from devices which just don't cut the mustard. The introduction of Markway's wife, played by Lois 'Moneypenny' Maxwell, is largely unnecessary - especially when she randomly appears in the attic like the mad first wife of Lord Rochester in Jane Eyre (which in turn inspired Rebecca). The opening prologue, whilst being deliberately hackneyed, almost overcooks things from the off, and it's only through a speedy introduction to Markway's plan that we choose to overlook it. The Haunting remains a scary and significant horror movie which still holds up to some degree even after nearly 50 years. 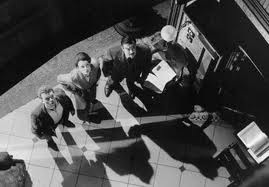 Its inventive take on the haunted house motif is complemented by Wise's solid direction and a series of good performances (including an unrecognisable Valentine Dyall as Mr. Dudley). It's dated and cheesy in places, and has long been surpassed by The Shining and its successors. But as a yardstick against which ghostly movies should be measured, it still has the power to spook.